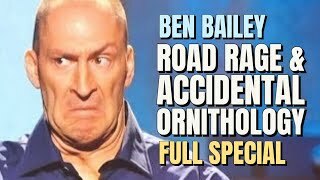 Acclaimed stand-up comedian, Ben Bailey is the most desired cabbie in New York. He is the host of the highly successful shows "Cash Cab" and "Cash Cab: After Dark" on the Discovery Channel. He was singled out by publications such as Entertainment Weekly, who put Ben on their MUST LIST in 2006, People magazine who said "All Hail Cash Cab," and the New York Post. As a stand-up he has also been profiled in publications such as the New York Times, Maxim, the Associated Press and other reputable publications as well. In fact, "Cash Cab"	has gained such a following that he received a Daytime Emmy nomination last year for "Outstanding Game Show Host." As far back as Ben can remember, he was always delivering something. Whether it was flowers, sandwiches, pizza or people, he had over 68 odd jobs prior to and during his stint as an up and coming stand up comic. He recalls driving passengers in his limo, dropping them off, and then hitting the comedy clubs before coming back to pick them up and take them home. In fact, some of his passengers were so enamored with him that they even came to watch him perform! So, when Ben was offered the job as the host of "Cash Cab," driving was a no brainer. And when he was told that he had to successfully pass real taxi school to become a licensed cab driver in New York City to take the job, Ben passed with flying colors. Ben got his unlikely start as a stand-up comedian when he was mistaken for a comic in the green room of The Comedy Store in Los Angeles where he was hired to answer the phones. The booker seeing that the other comics in the room could not get enough of Ben's humor booked him on the spot. After a few years of performing in Los Angeles,	Ben moved back to New York and for two years consistently went to open-mic nights to hone his craft and he hasn't stopped making people laugh since. Now with over 10 years under his belt as a successful stand-up comedian, Ben continues to perform all over New York City and has achieved international acclaim for both the show "Cash Cab" and performing stand-up comedy all over the world. He has appeared at the Aspen Comedy Arts Festival in 2002 and again in 2004 while promoting the movie "Bad Meat." He has performed at the Edinburgh Festival in 2000 and again in 2004 as well as the Masters show at the Montreal Just for Laughs festival in 2005. Ben was also a "Star Search" semi-finalist in 2003 and was an audience favorite where 16.2 million people saw him perform. Ben has also guest starred on numerous television comedies and dramas such as: ABC's	"The Knights of Prosperity" & "Hope & Faith", NBC's "Law and Order SVU," and Fox's "Mad TV," as well as a recurring role on "One Life To Live." His upcoming special "YouSpoof 2.0" will debut on the Discovery Channel later in 2008. Some television highlights of Ben's career include his own Comedy Central Presents Special, and performances and interviews on shows such as: "The Tonight show w/Jay Leno," the "Late Late Show with Craig Kilborn," "Last Call with Carson Daly", "Comedy Central's Premium Blend," "The World Stands Up," and "Tough Crowd w/Colin Quinn." Film roles include a featured role in "Spiderman 2," and the independent comedies; "Bad Meat," "Don't Shoot The Pharmacist" "They're Made Out of Meat " , "Meet Me at Rays," (also co-wrote/directed).In addition to being the host of "Cash Cab," Ben is also a trained tri-athlete, preparing for a ½ Iron Man competition in October of 2008. This triathlon includes a 1.2 mile swim, a 56 mile bike trek and a 13.1 mile run.Ben Bailey is from New Jersey.